The waters east of Queensland’s Fraser Island and Hervey Bay, just below the bottom of the Great Barrier Reef, have long been known to produce exceptional marlin fishing – for blacks, stripes and blues. However, to reach the open ocean from Urangan harbour it’s a long trip up the inside of Hervey Bay even before you get to Breaksea Spit. The 75 nautical mile journey from the marina to the continental shelf drop-off means very few gamefishing boats ever get the opportunity to sample outer Fraser Island’s rich treasures. In early summer last year, several gameboats heading south after completing their Cairns heavy-tackle charter seasons stopped at Fraser Island and found the region firing with outstanding numbers of blue marlin. 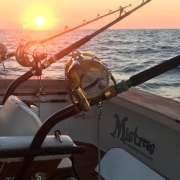 Capt Luke Fallon also took his liveaboard charterboat Kekoa from Cairns to Fraser Island specifically to fish light-tackle on a blue marlin world-record quest for renowned US anglers Gary and Sherrell Carter. Several boats from the Gold Coast also made their regular trek north to fish the grounds, including Graham McCloy and Barry Alty, both of whom had a burning ambition to catch Australia’s first officially weighed ‘grander’ blue marlin – as recently accomplished in Exmouth, WA. In November, Graham caught a fish on a lure that he felt sure was over the required 453.6kg, but it turned out to be a black so he tagged and released it. Aboard his charterboat Mistress, Barry Alty has spent more days fishing these grounds than anyone else since 2015. With his son Brett at the helm, for the 2017 season he took his boat north in mid-August and soon found plentiful baitfish and world-class marlin action. Making 3-day-plus live-aboard trips from Urangan, by November 26 they had tagged 114 marlin in 44 days of fishing, comprising 87 blues, 20 blacks and 7 striped. The blues, Barry said, were typically between 180 and 300kg, and the stripes between 110 and 135kg – all fat and in peak condition. The day before the Mistress team headed back to the Gold Coast on 7 December, Barry released four blues to around 320kg and lost a potential grander blue that smashed a Tornado lure made specially for him with the words ‘Barry’s Grander Lure’ inside the head. The marlin screamed off 100m of line once hooked, then threw the lure, but followed it as Barry cranked it back to the boat, striking it twice more and hooking-up briefly before again shaking the hook free. What a heart-stopping way to finish the trip! Mistress will be back next year from August to November inclusive, offering live-aboard charters. For details, call Capt Brett Alty on 0417 766 734. Hi all, as some of you may already know Mistress is out of the water and undergoing a major refit. She is having a big birthday after 12 years of chasing blue and Black marlin along Australia’s east coast from Cairns to the Gold Coast. 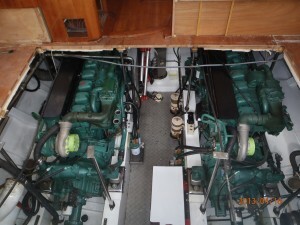 On the list are new engines, a new generator, re furnished interior, new LED lighting, and a full paint job. 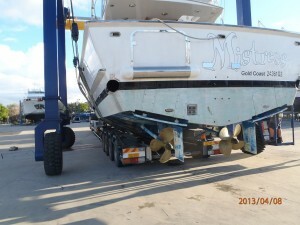 She is out of the water on the Gold Coast. Work is being done by Captain Brett and Steve, who was involved in the building of the boat some 13 years ago in New Zealand. Mistress came out of the water three weeks ago, and already the original engines have been removed, the generator is out and the tower has been removed. The refit will be completed by August, ready for the Cairns heavy tackle Black Marlin Season. Progress reports and photos will be posted as they occur. We still have days available for the Cairns Black Marlin Season so get in quick and be the first to experience fishing on this beautiful vessel, with all her new jewellery . Tight lines and good fishing…………. The Queensland Game Fish Association Inc. (QGFA) has awarded Barry Alty with the “Champion Angler Overall” for the most tagged & released billfish for 2011/2012. He was awarded a sensational trophy by the QGFA during the last QGFA AGM, in Mooloolaba, that was graciously accepted on his behalf by the Gold Coast Game Fish Club Inc. attendees. Barry’s efforts & achievements for Queensland Game Fishing this year have not gone unnoticed and he is duly deserving of this award. 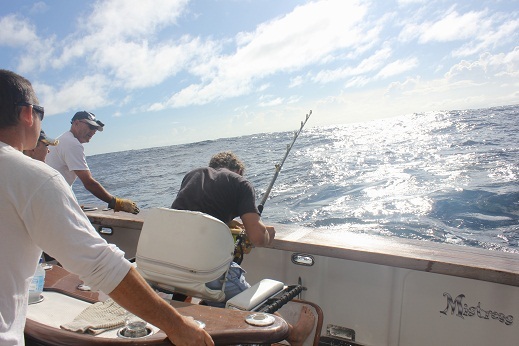 The good fishing off the Gold Coast continued through March and April. We have been averaging one Blue Marlin per day, with the majority being around the 300lb mark. Our best fish, which we tagged was a beauty that we estimated as being in the order of 800lb. There were two highlights during the period. Firstly the New South Wales Department of Primary Industries, who run Australia`s Gamefish Tagging program released the results for the 2010/2011 Season. As is normally the case “Mistress” tagged more Blue Marlin than any other boat in Australian waters. We actually tagged more than 3 times as many as the second placed boat!!! Our other big event was tagging a Striped Marlin for 14 year old Kyle Fletcher on the first occasion he had had the opportunity to fish Heavy Tackle using a Chair. Young Kyle has ridden along with us a few times during Tournaments. He is a mad keen Fisherman and good to have on a boat as he helps clear gear, and takes the hand held video for us. As a reward for his effort and enthusiasm we decided to give Kyle a day as Angler. He didn`t let us down doing a really good job in the chair on a Striped around 170lb. The fish would have beaten the current Queensland Junior Record, but to his credit Kyle elected to Tag it. However, we did make a movie of him in action so he does have a permanent record of his achievement. Also first time angler Vlad Puljich fishing on his 40th birthday caught and released a blue marlin of 450lb. Congratulations Vlad on your first Marlin Tagged & Released and Happy Birthday. The other news is that we now have a pair of Video recording Sunglasses on the boat. Just amazing how good the video from these small cameras is these days.